Big game fishing gets a lot less complicated when you have the right tools and equipment. 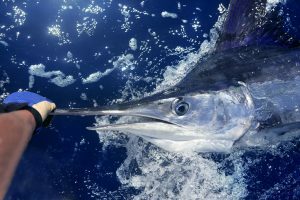 The reel that you use on your fishing rod should be strong enough to withstand the strain and pull of a marlin or other big fish. Poor quality reels can explode when a charging marlin tries to wriggle itself free and this could cost you your big moment. The fishing lures you use also influence your success with big game fishing. Lures can be made to be bright in color and there are those that are also dark. Bright lures are ideal when it is clear and sunny, while dull lures should be used on dull days. The hooks on these lures should be very strong for a proper grip on the catch. You can find all this fishing equipment and much more at Barnebys online auction. With several houses represented on the site, anglers can find anything that they need in one user-friendly place.